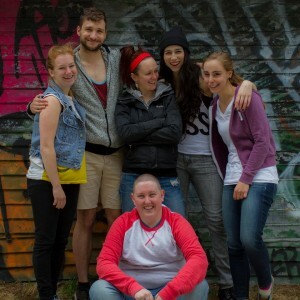 Two weeks ago I was fortunate enough to be part of Blue Dagger Theatre’s production of Concrete Kid and tour it to the London Fringe! We began our early morning rehearsals about 6 weeks ago and very quickly started creating a very detailed and polished piece of theatre! 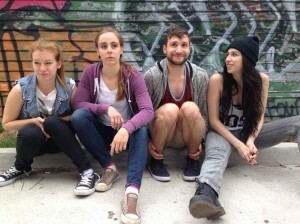 Concrete Kid is a lesbian coming of age tale set against the vibrant backdrop of Toronto nightlife. With slam poetry, hip hop, a chorus of hot queers and a little bit of drag for good measure, 18 year old Jamie spends her first night out at a gay bar while her less-than-understanding parents prepare to send her to the country for the summer. During our run in London we received several great reviews as well as numerous standing ovations. Facebook? https://www.facebook.com/events/303978359777221/ More info on Concrete Kid can be found through that link! Happy Fringe! Concrete Kid Teaser Trailer from Ray Jarvis Ruby on Vimeo. P.S. 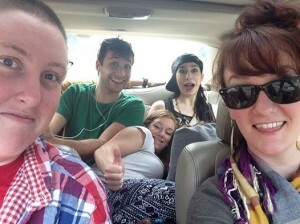 This is how we drove to most of our shows to London…there are TWO other cast members in the back of this car. Big props to our writer Ruby Ray Jarvis (Left) and our director Erin Kehoe (Right) for making this experience so much fun!